The first Marhoff Reel Company reel and its twin, the first Shakespeare Marhoff Patent reel. As an industrial engineer, William Shakespeare Jr. had a fascination with the mechanics of fishing reels. As a businessman, he realized a well-built, functional reel would sell more fishing lures, rods, line, and related paraphernalia than any other single piece of angling equipment. The history of Marhoff reels reflects Shakespeare’s talents as an engineer and entrepreneur. It also speaks well of his deep respect for his colleague, friend, and the reel’s credited inventor, Walter Marhoff. The purpose of this work is to share a starting point for comparative research on Marhoff reels. It is primarily based on Marhoff reels the author has actually had in hand, so significantly limited by the author’s discretionary funds. It is biased by the author’s primary interest in the earliest Marhoff reels. It is supplemented by data from other collectors within the ORCA and NFLCC communities. It is plagued by all the issues faced by industrial archeologists, especially after-market tinkering and disconnects between what was manufactured and what was advertised. The more data collected on found reels and ephemera, the less these issues affect our understanding. That being said, the author claims to be more an accumulator of, rather than an expert on, Marhoff reels. There is a lot of guesswork in the materials presented. There are important changes in reel production that are not discussed here with any vigor, like changes in screws, stamping sizes and fonts, spool variations, etc. That’s left to others who I hope take up the challenge and share the fruits of their passion. The second style was a significant re-design, patented by William Shakespeare in 1908 (2) and marketed from 1909 through the 1960s. Shakespeare initially stamped these reels “Marhoff Patent Level Winding Reel.” In his 1909 dated catalog, he gave them a “1964” style code. From the 1910 model on, all Shakespeare Marhoff (SM) reels had a 1964 stamping somewhere on the tail plate. MODEL – The term model, as used by Shakespeare, was a marketing tool to suggest improvements over previous models. Beginning with the 1910 season, Shakespeare used an oval foot stamping that included a model indicator. Note the stamp reads “1910 Model,” not Model 1910. SM reels have been found using this same type stamping for 1912, 1914, 1918, 1919, 1922 and 1924. Then came “Model 26” and “Model 30” in a simple foot stamping. From Model 31 on, the stamping was on the tail plate. Early in the production of Model 32, the model convention changed to a two letter coding system, e.g., Model HJ. For easier reference here, the letter codes are followed by the corresponding year. Model GE (1946) was the last time a model change was designated, although model GE designated reels were available into the early 1960’s. It is generally assumed that a new model Marhoff was in production late in the year preceding the model year (so the reel would be available for the designated year’s fishing season). Ergo, the model year was circa the actual production time, but not a guarantee. VERSION – SM production changes did not necessarily match the progression of model numbers. The author uses the term version to describe production variations that appear independent of model changes. In general, a variation found in two or more reels in the author’s collection, or corroborated by examples in other known collections merits an assumption of a true version. Single examples of variation are assumed to be prototypes or experiments. 1. 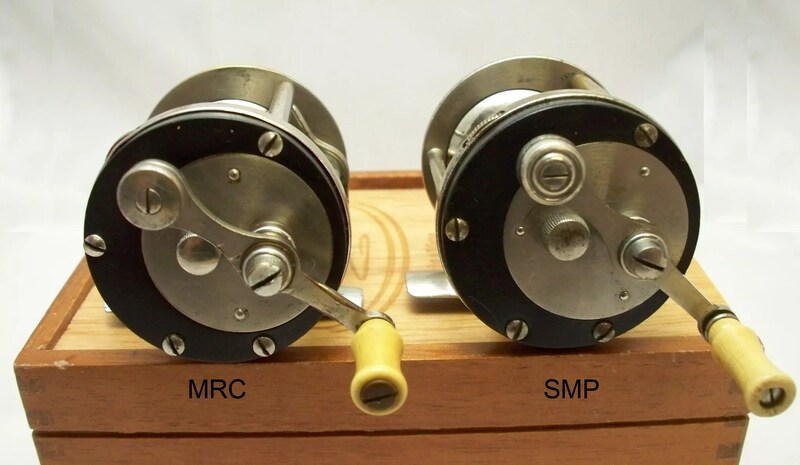 There were two versions of the MRC style reel; those made entirely with parts and stampings from Walter Marhoff’s circa 1907 – 1908 production, and those made with both MRC and SM parts and/or stampings circa 1908 – 1909. 2. Shakespeare bought the Marhoff Reel Co. in May of 1908. The sale included Marhoff’s patents, an unknown number of assembled MRC reels, unfulfilled orders for MRC reels, and a stockpile of MRC made parts. MRC reels were already getting positive reviews. In retrospect, keeping MRC reels (and the Marhoff name) in the market while Shakespeare tooled up to produce his style Marhoff reel was a good business move. Plus, mechanical engineers hate to waste parts. 3. Walter Marhoff made his reels on recently out-dated machinery bought (or borrowed) from William Shakespeare. Probably to minimize re-tooling, Walter used the machine set-ups and production techniques already in place wherever he could. So things like end plate circumference, foot mountings, pillar length, etc. were standardized between the two companies. That made it possible for Shakespeare to use some of his new SM style parts to complete assembly of the last of the MRC reels. 4. MRC serial numbers suggest about a thousand MRC reels in total were produced. It is unclear how many of the first version reels were actually assembled by Walter Marhoff before the company was sold to Shakespeare. We can better estimate when the second version MRC reels were assembled by looking at reels with newly produced SM parts and stampings. A caveat with this approach is that down-line anglers, repair shops, collectors and ‘vintage’ reel dealers could also use various style and model Shakespeare reel parts to repair or modify MRC reels. The first version MRC reels were based on Walter Marhoff’s second reel patent (4). The result was the first market successful level winding reel using a single worm gear – the basis for the majority of level winding reels still being sold today. The detailed description is available in the previous cites. Keep in mind that serial numbers do not reflect the actual order of production when studying mass produced reels. Assembly required pulling parts as needed from parts bins. Serial numbers were added to reel clips (reel feet) in batches, then placed in the ‘feet’ parts bin. So the serial numbered parts were not necessarily (or likely) used in strict chronological order. That makes it harder to identify when the second version (MRC reels completed using Shakespeare parts and/or stampings) were assembled. The Marhoff Reel Co. style reels and the first model of the Shakespeare style Marhoff reels appeared almost identical. It looked like Shakespeare simply took over MRC reel production. However, a part by part comparison between these reels revealed significant internal (5) and less obvious but important external (6) differences (see Appendices A and B for parts comparison photo and key). It appears Shakespeare had designed and was tooling up to make the first model Shakespeare style Marhoff patent reel within a few months of acquiring the Marhoff Reel Co. That is likely why Shakespeare parts were available to complete second version MRC reels. By August 1, 1908, Shakespeare was offering the No. 1964 ‘Marhoff Level Wind’ to jobbers for $7.50. The 1909 Shakespeare catalog offered the ‘Marhoff Level Winding Reel’ to anglers for $15. The catalog description was generic enough to apply to both the MRC and the first Shakespeare style Marhoff reels. So when Shakespeare ran out of first and second version MRC reels, he filled remaining and subsequent orders with the first model Shakespeare Marhoff reels! With twenty branded models of Marhoff reels, a narrative description of each would boggle the mind of author and reader alike. Instead, the Marhoff model progression is represented in spreadsheet format, based on reels in the author’s collection. Each model section has a brief discussion of apparent changes found from the prior model. Each found reel is cataloged by coded features, including notes that may or may not be helpful. The feature code key includes brief descriptions and notes. Photo notes are provided on selected features, and an attempt to catalog Marhoff boxes is included. The true power of the Old Reel Collectors Association (ORCA) is the willingness of its members and friends to share information, insights, and even reels from their collections to add to our understanding of reel history. I am indebted to many for their help as I grappled with my Marhoff obsession over the last 15+ years, including Alan Baracco, Andy Foster, Bill Graves, Bill Sonnett, Carl Corey, Dale Noll, David Lehmann, Eric Jeska, Harvey Garrison, Jerry Shemechko, Jim Schottenham, Joe Klaus, Les Marhoff, Robyn Summerlin, and Steve Vernon. It is hard to match the passion Eric Jeska has displayed in his interest in and research about his Grandfather, William Shakespeare Jr., and the related Shakespeare companies. It was Eric’s early works that sparked my interest in the history of Marhoff reels. In review of this work, Eric took exception to calling his Grandfather an industrial engineer. Eric’s own father was a formally trained and certified Industrial Engineer. William, he suggested, was a talented machinist and inventor, but not a industrial engineer. I struggled with this for some time, then chose to keep the reference as a sign of respect for William’s work rather than as a true term of art. I hope I will be forgiven. 2: Friend and fellow collector Jerry Shemechko had for many years expressed an interest in my Marhoff collection. This last Summer, having completed my research to my satisfaction (and to my spouse’s delight), I passed the collection on to Jerry. I trust it made him happy over the ensuing few months. Jerry passed on October 24th, 2018. 1. Walter Marhoff learned the reel business as a valued employee and close friend of William Shakespeare. 2. Shakespeare helped Marhoff set up the MRC circa 1906. When Marhoff’s tuberculoses took a turn for the worst in 1908, Shakespeare bought the MRC and put his friend back on the Shakespeare payroll. Marhoff passed away some four months later. 3. Jeska, E., “The Marhoff Story – The World’s Best Reel,” Reel News, Vol. XXVI, Issue 6, 2016 Sawisch, L., “Reel Insights about the World’s Best Reel,” Reel News, Vol. XXVII, Issue 2, 2017. 4. US patent # 853,311, filed October 22, 1906 and awarded May 14, 1907. 5. For example, first version MRC spool journal bearing was mounted on the head plate; the SM bearing was mounted on the head plate cover. It is hard to see the difference without taking the reels apart. You also wouldn’t notice that MRC and SM thread counts on screws, drive gears, and spool end bearings do not match. 6. For example, SM crank knobs are longer than MRC knobs, and they also have a metal bushing.